Waukesha, WI – January 2018 – Wildeck, Inc., has been awarded U.S. Patent No. 9,834,975 for its innovative “Hazard Alert Device for Elevated Barrier,” know commercially as Wildeck’s EdgeAlert™ Open Gate Alarm System. The invention is just one example of the company’s emphasis on customer safety in all its product lines (guards, mezzanines, lifts, and access products). The inventors on the Patent are Keith G. Pignolet (Chairman of the Board; former President) and Stephen M. Payne, Electrical Project Engineer). In today’s busy distribution centers, warehouses and manufacturing facilities, an open gate on an elevated mezzanine level is a serious safety concern that could result in an employee falling and sustaining severe injury, including broken bones, lacerations, or even death. For every elevated application where an open gate situation could occur, an early warning device such as Wildeck’s EdgeAlert™ Open Gate Alarm System could make all the difference. When properly installed, the EdgeAlert™ alarm will signal an open gate condition with a highly visible flashing light and a loud audible alarm. Use of Wildeck’s EdgeAlert™ Open Gate Alarm System can also assist facilities in compliance with federal and state safety regulations. The EdgeAlert™ alarm is easy to operate and can be installed on new or existing swing gates, slide gates, tilt gates and scissor gates. It includes a 120 VAC plug-in power supply and can also be powered by (4) long life alkaline “D” cell batteries (not included with the device). A Single-Pole, Single-Throw 30V, 2A, 60W Relay Output is provided for connection to other alarms or safety controls. A dual-channel processor system is self-monitoring and will display a “fault” signal if a sensor or wiring problem is detected. For maximum visibility at elevated and ground levels, amber-colored LED lights are located on the front and back of the alarm enclosure. When a gate is being used, workers may choose to silence the EdgeAlert™ alarm for 120 seconds by pressing the “Snooze/Acknowledge” button. However, during this brief loading or off-loading period, the highly visible warning light continues to flash. Once an open gate has been closed and secured, users can reset the EdgeAlert™ alarm by pressing the “Snooze/Acknowledge” button again, or simply opt for the Automatic Reset mode. 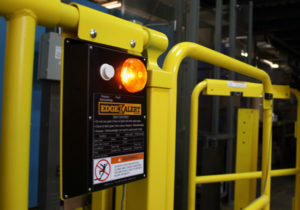 “Our patented EdgeAlert™ Open Gate Alarm system is an example of Wildeck innovation and market leadership as a designer and manufacturer of safety products and options for storing, lifting, guarding and access equipment,” Schlegel said. Wildeck, Inc., based in Waukesha, WI, is in its 42nd year as the largest manufacturer of industrial steel work platforms (mezzanines), VRCs (vertical reciprocating conveyor), safety guards, and access products. Wildeck products are “Made in USA” and are used for the safe and efficient handling, storage, and protection of materials and personnel. For more than four decades, the company has grown through a dedicated and experienced nationwide network of customer-service-oriented dealers and systems integrators. For more information on the patented EdgeAlert™ Open Gate Alarm System, or the complete line of Wildeck products and services, call 262-549-4000, or email info@wildeck.com.